Armistice 100 – an End to War? After four terrible years, the First World War finally came to a close with the signing of an armistice between Germany and the Allied Powers on 11 November 1918. On the 11th hour of the 11th day of the 11th month, the guns famously fell silent. One hundred years on, commemorations across the globe will recognise the service and sacrifice of those involved in the conflict; 158 nations, forty million military and civilian casualties and hundreds of billions of dollars for military, medical and rebuild costs. 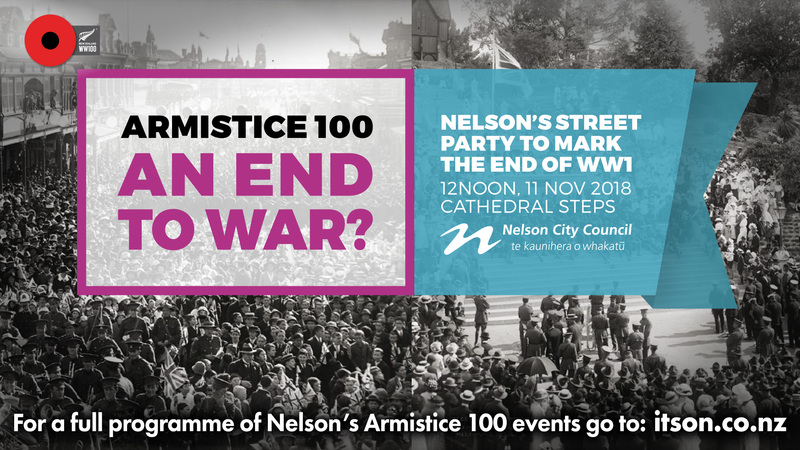 To commemorate this prominent date in history, Nelson City Council alongside other organisations and groups, has organised a line up of events that you’ll want to see. The day starts with the RSA’s re-dedication of the Cenotaph at ANZAC Park and a service at the Christ Church Cathedral before an outdoor community event at Upper Trafalgar Street and the Church Steps which gets underway at midday. From street performers, a family corner and alfresco dining to a street display of photographs showing Nelson’s 1918 Armistice celebration and historic vehicles, there is something to see and do for everyone in the family. A ‘Wall of Remembrance’ banner will be displayed listing the names of all those who served in WW1 from Nelson. Histrionics, Nelson’s living history drama group, will perform a full length play called ‘Armistice at Compiègne’ at 11.45am, 1.10pm and 2.50pm. The story is based on the actual Armistice signing in a railway carriage in France. A sculpture featuring thousands of flax poppies will be created at the event by artists and the community. Feel free to bring along your own flax poppies to contribute to the artwork. Join us on 11 November at midday to commemorate the 100 year anniversary of the end of the war. For more information about these activities or other Armistice related events see itson.